Morrisons customers have the chance to eat like a soldier this Armed Forces Week, with a pie created by ex-servicemen from a famous Armed Forces recipe. 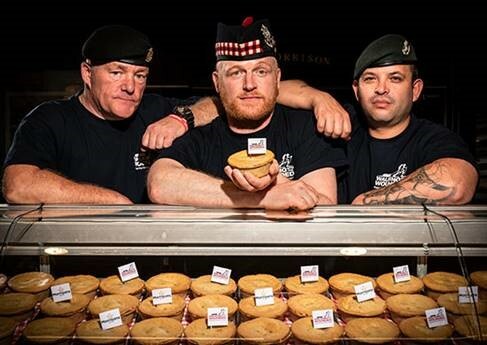 The Morrisons ‘Veterans Pie’, which launches this week will raise money for Walking With The Wounded - with 50p from each £1.10 pie donated to the charity - and includes an original ‘range stew’ recipe served to troops in action. The official 'Range Stew' recipe is a closely guarded secret, but a handful of army veterans have helped us to recreate this army classic for a great cause - our version is made from 100% British Beef steak, smoky bacon and a decent glug of Theakston’s Old Peculiar Ale. Morrisons ‘Veterans Pie’ is available for £1.10 each or two for £2, across all Morrisons Market Street Pie Shop Counters from Monday 25th – Sunday 1st July. A massive thank you to Morrisons for once again showing its support for our Armed Forces.